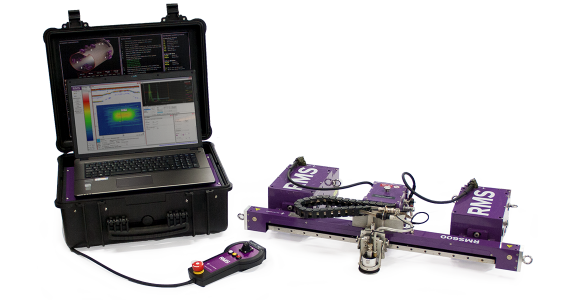 RMS2 is a high-speed, high-accuracy remote-access ultrasonic corrosion mapping system. It is designed to assess the condition storage tanks, pipelines, pressure vessels, and other critical equipment. It fits well in inspection programs supporting integrity management processes, ensuring effective and safe operation. RMS2 offers 100% coverage in a band up to 1 m wide, significantly increasing the probability of detection (PoD) of defects, enabling engineers to determine optimal repair strategies, and improve remaining life assessment (RLA) and risk-based inspection (RBI) maintenance programs. Every model in the RMS2 line, are equipped with automated ultrasonic scanner heads that share the same high-performance system controller, making it possible to use different heads according to inspection requirements. The steerable tractor of RMS2 incorporate high-torque stepper motors and powerful magnetic drive wheels, ensuring the scanner remains fixed to the inspection surface even when it is inverted. The RMS2-600 scanner head is designed to maximize scanning rates on large surfaces such as tank shells, pressure vessels, and other structures. The RMS2-450 scanner head is designed for circumferential operation on curved surfaces from 152 mm (6 in) in diameter to flat surfaces. The RMS2-300 scanner head is a general-purpose scanner to inspect areas with limited access or other applications where smaller scan widths are necessary. The RMS-ARC 24 -36 and 36-48 are designed to operate longitudinally on pipes 610–1219 mm (24–48 in) in diameter. The combination of longitudinal pipe scans and 60° width is a major improvement to ultrasonic testing (UT) efficiency in pipeline applications, while maintaining the high data quality associated for which RMS2 is known for. The RMS2 software integrates scanner control, data capture, data analysis, and reporting tools. The software displays ultrasonic A-scan, C-scan, thickness measurements, and positional data in real time, with a maximum resolution of 0.5 × 0.5 mm (0.02 × 0.02 in). This information is recorded when a scan is saved. The modular user interface is designed to hide and restore infrequently used controls with a single click, and save specific display layouts for future use. The ultrasonic controls are similar to those on a standard ultrasonic flaw detector, therefore trained ultrasonic operators can quickly become familiar with all the software functions. The RMS2 software is designed around the concept of C-scan layers, which enables operators to quickly switch between the multiple C-scan views generated during scans. The A-scan trace and the C-scan image are displayed in real time, and you can add multiple A-scan gates to measure between portions of the trace. This means you can measure the signal’s amplitude, the part thickness, the internal surface profile, and the external surface profile simultaneously. After acquiring the scan, you can analyze it again by adjusting gate settings to produce a more accurate C-scan image or highlight particular indications. This powerful tool minimizes the need for re-scans caused by changes in surface conditions or minor setup errors. RMS A-scan waveform processing is completely digital, in real time during scans and during post-processing. The system records A-scans in raw unfiltered RF form, which can be processed afterwards, including rectification, filtering, wave smoothing, and noise rejection. This minimizes the setup on site and avoids re-scans caused by incorrect ultrasonic setups. Another feature of the RMS2 software is floating flank gates. The floating gates track to the same percentage of the signal amplitude. This enables signals of much lower amplitude to be picked up, improving the accuracy and increasing the efficiently of data analysis and reporting for greater confidence in inspections. The amplitude view shows the B-scan profile in both X and Y dimensions at a selected point in a C-scan. Using the B-scan amplitude view, operators can easily identify any defects or inclusions. C-scans are an effective method of viewing general wall thinning and larger defects, but small pit and inclusion indications can often be difficult to see because of their small surface areas. By reviewing acquisitions in B-scan mode, you can quickly identify and size these potentially critical indications. The software also has a stacked B-scan mode to help with identification of step-wise cracking and defects not aligned with the X and Y scanning directions. 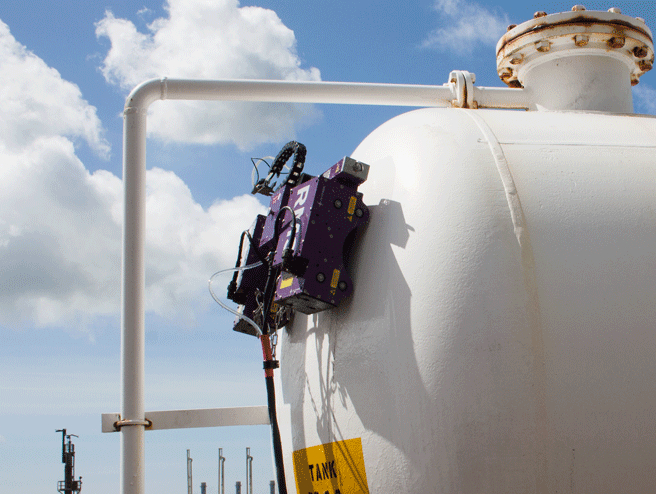 The Scorpion2 dry-coupled, remote-access ultrasonic crawler brings major efficiency and data improvements to tank shell inspections and other structures such as vessels and offshore installations. Inuktun’s MaggUT inspection camera is a rugged portable crawler suitable for ultrasonic A-Scans or B-Scans and visual inspections of a variety of objects and surfaces.